This is the fourth Christmas without Joe. While Christmas music still unsettles me, I am excited and filled with a joy and anticipation not known for years. 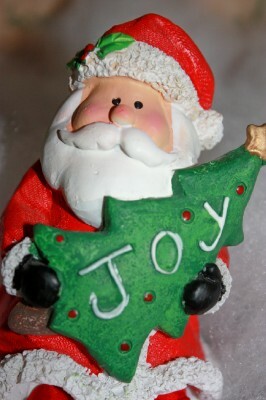 I attribute my feeling towards this Christmas to preparing for “40 Days of Joy” series. It was several months ago I decided to do a holiday series helping those who are grieving but keeping it generic enough that those who are not grieving would also find joy. This series practically consumed me, which has been a good thing. God has used this series to fill me with Christmas Joy and I am very grateful and have spent weeks rejoicing while doing the series preparation. My Christmas cards were in the mail on Thanksgiving Eve. I have never gotten them out that early but I was anxious to start spreading Christmas cheer. If you are grieving the passing of your spouse or other loved one, or have just lost that Christmas feeling, rest assured you will once again feel Christmas joy warming your heart. God reignited my passion for Christmas, He will reignite yours as well – when the time is right. Christmas! The very word brings joy to our hearts. No matter how we may dread the rush, the long Christmas lists for gifts and cards to be bought and given – when Christmas Day comes there is still the same warm feeling we had as children, the same warmth that enfolds our hearts and our homes. yes JOYRETURNS…it is yours to keep….. !!! !